What Is Chia Seed Oil? Macadamia nuts originate from eastern Australia, New Caledonia and Indonesia and they're sometimes referred to as "the queen of nuts." Macadamia oil is obtained by expressing the oil from the meat of the nut. Cold-pressed or extra-virgin macadamia oil has a light amber color and a mild nutty taste, while refined macadamia oil is almost transparent. Macadamia Nut Oil has 611 Calories and 16.67 g of Protein per 100 gram serving according to the nutrition facts provided by the USDA Food Composition Database. Macadamia oil, just like any other oil, is rich in calories and fat. A 1 tbsp. serving has 120 calories, 14 g of fat and no carbohydrates or protein. 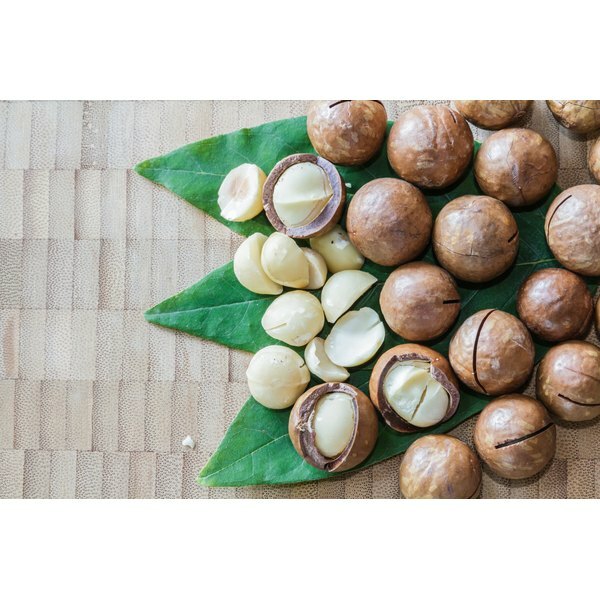 Macadamia oil, especially if it is cold-pressed, is a good source of vitamin E and other health-protective phytochemicals, like polyphenols and flavanols in addition to providing cholesterol-lowering plant sterols. The fats in macadamia oil are mainly monounsaturated. Of the 14 g of fat in 1 tbsp. of macadamia oil, 1 g is polyunsaturated, 2 g are saturated and the remaining 11 g are monounsaturated. Monounsaturated fats are less prone to oxidation compared to polyunsaturated fats, which gives macadamia oil a shelf life of one to two years. Monounsaturated fats also have the ability to lower your low-density lipoprotein cholesterol levels, which can help lower your risk for heart disease. A good ratio of omega-6 to omega-3 is important to lower your risk of developing chronic diseases, like cancer, cardiovascular diseases and rheumatoid arthritis, as explained in the October 2002 issue of "Biomedicine & Pharmacotherapy." The typical American diet contains disproportionally high amounts of omega-6 in comparison to small amounts of omega-3, making the ratio close to 16:1. The ideal ratio is estimated to be between 1:1 and 2:1. Macadamia oil has a ratio of 1:1, which makes it an ideal oil to help you keep your omega-6 to omega-3 ratio balanced. In comparison, olive oil has a ratio of 12:1 and therefore contains a lot more omega-6 in comparison to its low omega-3 content. Macadamia oil has a smoke point of 413 degrees Fahrenheit, making it suitable for cooking at relatively high temperatures. Its light taste make macadamia oil suitable for cooking meat or vegetables, preparing marinades or making a homemade salad dressing or mayonnaise. You can also use macadamia nut oil in recipes for baked goods. How Many Calories Are In Sunflower Oil?